I love this recipe because it’s simple, it’s sweet enough that the kids love it (easy on the red pepper flakes if you are feeding someone sensitive to spice) and packed with veggies so it’s a good way to make a dent in our “5 a day”! This is enough for four adults…with three kids eating I had plenty of leftovers. It took me about an hour from the time I walked in the door from work until it was on the table. I, however, had to love on some kids, sign permission slips, help with the 12 x’s table and console a little one for losing at Chutes and Ladders. Let’s not forget putting on the yoga pants, get hair up in a clip and pour a glass of wine, too! So, after all the meat and veggies are cut (do ahead if you want to make it a VERY quick meal), only about 15 minutes is needed for actual cooking time. This means plan accordingly if you are preparing rice or noodles with it so it is all done at the same time. Enjoy! In a medium bowl, toss the chicken with the sliced onion, one clove of minced garlic, half the ginger, the soy sauce, sugar, 1 teaspoon of the cornstarch, 1 teaspoon of the salt, the sherry, and the sesame and olive oil equaling 1 tablespoon (most recipes call for all sesame, but it’s too much for me). Using hands, really coat the chicken with the mixture. Marinate at room temperature for 15 minutes. Mix the remaining tablespoon cornstarch with 1/3 cup water in a small bowl and set aside. Heat a large nonstick skillet over high heat. Add 1 tablespoon of the olive oil and heat. 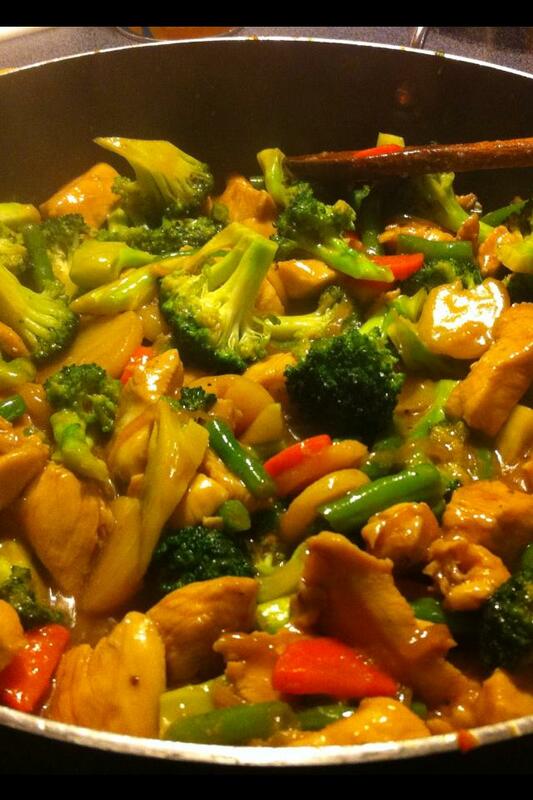 Add the veggies and stir-fry for 30 seconds. Add the remaining minced garlic, ginger, 2 tablespoons of water, and season with 1/4 teaspoon salt, and pepper. Stir-fry until the veggies are bright but still crisp, about 3-4 minutes. Transfer to a plate. Get the skillet good and hot again, and then heat 2 more tablespoons oil. Add the chicken and chili flakes if using. Stir-fry until the chicken loses its raw color and gets a little brown, about 4-5 minutes. Add the hoisin sauce, return the veggies to the pan and toss to heat through. Stir in the reserved cornstarch mixture and bring to a boil to thicken. Add more water if need to thin the sauce, if necessary. Taste and season with salt and pepper, if you like. Scallion greens and toasted sesame seeds can also be used to garnish.